The first video, below, is a DVD excerpt featuring the full-song performance of "Angeline the Baker" by Rob Ickes and Andy Leftwich. The second video includes an interview excerpt, plus (at 0:48) a portion of Rob's performance of one of his most-beloved and requested solos, "The Old Rugged Cross." 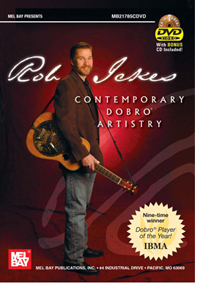 About Rob: The 10-time winner of the IBMA Dobro Player of the Year award, Ickes is a founding member of the acclaimed ensembles Blue Highway and Three Ring Circle. He has collaborated with a wide range of musicians, including Charlie Haden, Merle Haggard, Earl Scruggs, Tony Rice, David Grisman, Alison Krauss, Willie Nelson, David Lee Roth, Patty Loveless, Marty Stuart, Claire Lynch, John Cowan, and Mary Chapin Carpenter. The youngest dobro player on The Great Dobro Sessions (1994 Grammy, Best Bluegrass Album), he was also on the Alison Krauss & The Cox Family album, I Know Who Holds Tomorrow (1994 Grammy, Best Southern Gospel). About Andy: Andy started playing the fiddle at age of 6, learning first from his father, and then from local musicians in White House, Tenn. By the time he was a teenager, he was proficient on both the mandolin and the guitar in addition to the fiddle. When he was 15, he joined Valerie Smith and Liberty Pike as the mandolin and fiddle player, touring extensively with her throughout the late 1990s. In 2001, he joined Ricky Skaggs' band, Kentucky Thunder. Andy is also a founding member of Three Ring Circle. His solo debut album, Ride, was released in 2003, with Andy playing mandolin, guitar and fiddle throughout, and writing 10 of its 12 tracks. “Ickes expands the reach of resonator guitar as no other exponent of that instrument has done so far. His harmonic development tied to his melodic explorations . . . displays his limitless vision for the instrument.
. . . Ickes and [Andy] Leftwich jam intensely on war horses such as "Angeline The Baker" and "Wheel Hoss" mixed with original tunes titled "Monrobro" and "Sanford and Son." They explore the nuances of each tune and the emotion inherent in each tune. . . Accompanying the DVD is a CD containing all of the musical tracks on the DVD. This is a very nice package with lots of great music that will appeal to more than just resonator guitar fans and fans of Rob Ickes. It could well bring new fans to the fold.